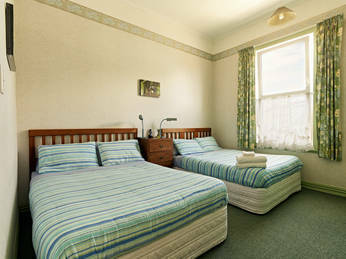 B&B Nelson New Zealand: AMBER HOUSE budget tourist lodgings aircon accommodation Bed+Breakfast in heritage Guest House. When Amber House was built, in the latter part of the reign of Queen Victoria, it stood on the southern shore of Nelson's Haven with fat little Weka running up and down the strand. Now the vibrant and exciting city of Nelson has grown up and outwards around Amber House, but our homestay remains a peaceful and helpful haven for travellers with all of our city's attractions just a short stroll from the front gate of our Irish rose garden. Our guests can amble to the nearby Miyazu traditional Japanese gardens and listen to the water bell, take a look at the new wharekai on Whakatu Marae, or simply sit on our verandah and enjoy the fragrance of our Irish roses in the front garden. On Friday afternoons, the Farmers Market is just opposite us in Founders Heritage Park while Saturday morning sees many of our guests off to visit the `World-famous-in-New Zealand' craft and artisan market in nearby Montgomery Square where they mingle with locals poking organic vegetables. Although crystal chandeliers hang from ceilings more than eleven feet high downstairs, all bedrooms are double glazed for restful nights, we do have a new 21st Century hot water system, Bly-ray players and High Definition LCD TV's, the fastest Internet in Nelson via opticla fibre and our Balcony Suite, Gold, Blue and Rose Rooms all have air-conditioning. 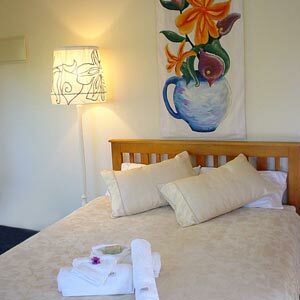 Upstairs, the en-suite Balcony Suite and Blue Rooms have their own balconies with a view over Tasman Bay to the Arthur Ranges on one side and the Sugar Loaf and Botanical Hill (geographical Centre of New Zealand) from the other balcony. Balcony Suite, Gold, Blue and Rose Room guests compliment us on our hot breakfasts cooked to individual order. Many folks have enjoyed one of our "Ulster Fry"s - or you can just help yourself to fruit any time and from a cold (or `continental' style) buffet breakfast if you`re watching your weight. Long distance coaches stop right outside Amber House Bed and Breakfast (B & B) Guest House - so you can lie in a bit longer if you're off on a day trip to the Abel Tasman National Park or paragliding that day... We have a garage for bikes, canoes and hovercraft and we grow many of our own vegetables organically in the sunniest place in New Zealand. All water is filtered for low chlorine drinking and bathing and is naturally soft. The Rugby World Cup 2011 venue, Trafalgar Park, was at the end of our street. Smokers may not stay at Amber House and we do not allow smoking anywhere on our land. We are not a motel or inn and do not have a reception desk staffed round the clock, so you will need to advise us of your estimated time of arrival when you book (and again if that estimate subsequently changes) so that we can be ready to welcome you. All prices quoted by Amber House are for immediate cash settlement and include cold and hot drinks, ANZAC biscuits and a satisfying breakfast (except for the Overflow Room tariff) together with all applicable taxes, levies and service charges. Our Balcony Suite occupies the entire North-East wing of the top floor of Amber House and is some 486 square feet in total area. Double glazed French windows open on to twin carpeted and sheltered balconies overlooking our front rose garden with 272 degree views out over Tasman Bay to the (snow topped in winter and spring) Arthur Ranges to the North-west from one balcony and the Sugar Loaf and Botanical Hill (geographical Centre of New Zealand) 900 metres to the South-East from the other balcony. Both balconies have clear, see-through zippered awnings that can be lowered on hand-cranked rollers if it becomes windy. The cooked breakfast of your choice can be served either here, on one of your private balconies, or in the downstairs dining room with other guests. We provide a complimentary selection of local wines and fruits, together with a cheese board. Our Gold Room is also on the upper floor - but at the South-East corner of Amber House. Adam thinks the Gold Room has the best view at Amber House - due South towards Dun Mountain, the Brook Waimarama sanctuary and the Sugar Loaf through twin, double-glazed, 'tilt and turn' windows imported from Germany. The setting sun is viewed between two large Canary Island palm trees in Cambria Street with Cathedral Hill and the Grampians providing a backdrop. A third large, double glazed window at the West of this bedroom has ultra narrow venetian blinds inside the argon filled gap of the sealed glazing unit (operated by a magnetic drive) so that they do not rattle in the regular sea breezes each afternoon. The Gold Room has a Daikin, reverse cycle air-conditioning unit to provide almost instantaneous and abundant heating in Winter and cooling in Summer. 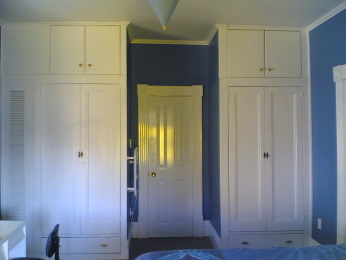 Our Blue Room is also on the upper floor with plenty of hanging space in the fitted wardrobe which contains a digital safe. There is a two seater couch, fitted carpet, a large work desk and swivel chair, one cordless, direct dial DECT phone and the highest speed internet connection (available in Nelson from Telecom NZ) to use with your laptop or ours included in the tariff. You may choose whatever you want cooked for breakfast (within reason) or a "continental" buffet type breakfast - both served in the guest dining room downstairs. The Blue Room has a Daikin, reverse cycle air-conditioning unit and argon gap, noise insulating, double glazing. The Rose Room has eleven foot high ceilings with twin crystal chandeliers and is furnished in late Victorian style. The original Victorian French doors made from Kauri wood have now been double glazed with low emissivity glass for quietness and insulation and open on to a verandah providing a separate private access to our Irish rose garden at the front. The ground floor Rose Room is spacious and has two Orthopaedic Queen-size beds, each with individual LED reading lamps, so a maximum of four persons can be accommodated. 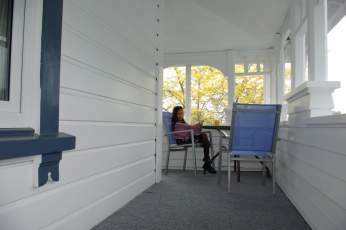 The Rose Room has fitted carpet and is air conditioned with a Hitachi reverse cycle heat pump. It has a large work desk with a chair, wardrobe with digital safe, cordless diect dial DECT 'phone, alarm clock radio, hairdryer and a chess set. There is a 32 inch LCD colour TV (with Nicam stereo) that receives 5 of the 31 channels in High Definition resolution and a DVD player. The Green Room on the ground floor is popular with those on a very tight budget since we have not increased this room's price for 7 years. We've been able to screw prices down by only including a continental breakfast and not including a cooked breakfast in this room's price and by not yet installing a heat pump. We change the sheets every 3 or 4 days of your stay (or if you have an accident) but we don't make up the Green Room daily for you and expect you to hang the towels we provide out to dry on the rotary dryer in the back garden in return for a very keen price. Even though it's our smallest, budget room, the Green Room is not spartan. It has fitted carpet, a large desk with chair, mirror, wall closet to hang your clothes and a chest of drawers with two bedside lamps. In hot weather a floor-standing fan is available; a fan heater and extra duvet will keep you warm in colder weather. The Green Room is equipped with a cordless, direct dial phone, alarm clock radio, hairdryer, chess set, LCD flat screen HD colour TV with MP3 playback and a small digital safe for valuables. The Green Room has two Queen sized beds so up to four can be accommodated. Full argon-gap double glazing with low emissivity glass and comfortable beds ensure a tranquil night. Your user agent or browser does not support the W3C recommendations for Iframes! Time to update your browser to firefox? Overflow Rooms: When space (or your budget) is very tight and you trust our choice, we have a network of accommodation choices (all within the boundaries of the City of Nelson unitary authority) where we can place you. Maximum occupancy of an Overflow Room is usually 2 people (occasionally 3) and obviously facilities vary; usually twin beds with a shared shower room/WC but could sometimes be a double bed with an en suite bathroom. Breakfast is NOT included in the Overflow Room tariff. Sometimes it may happen that, after you have reserved an Overflow Room, we get a cancellation in the main house. In this case, if you have a reservation for an Overflow Room, we may be able to accommodate you in Amber House itself in what we call an "Our Choice Room" at the same ultra-low price. 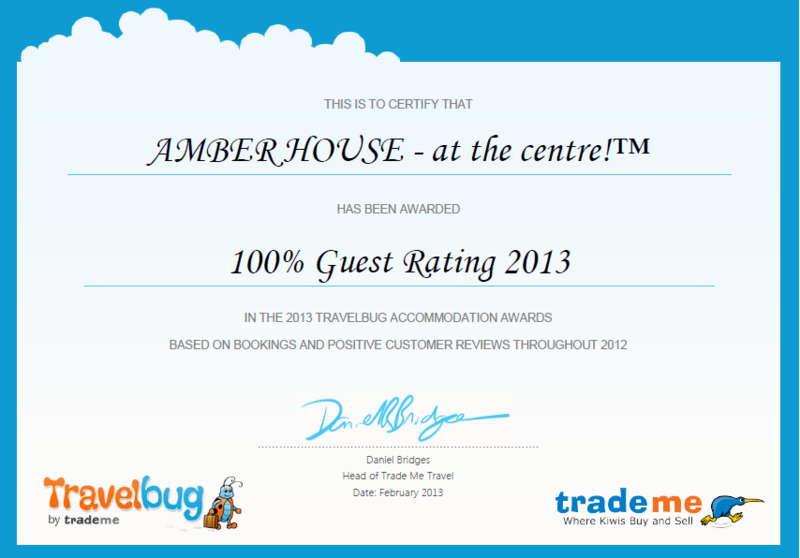 This is where you let us pick your specific bedroom in Amber House - and you are prepared to move bedrooms during the course of a stay of more than one night. You could get lucky and bag an air conditioned and en-suite "Our Choice Room"; equally you might end up without air-con and a heat pump and using a WC down the hall. Typically TWO beds (but could be one bed if we put you in the Blue Room). Digital safe, colour TV. No breakfast is included in either Overflow or "Our Choice Room" tariffs but, if you are staying in an Amber House bedroom, you can order a cooked breakfast of your choice for an additional $17 or a help-yourself uncooked breakfast for $8 per breakfast. 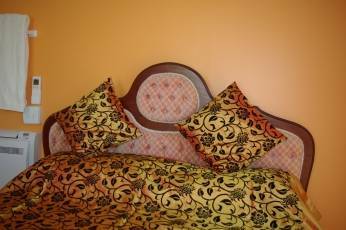 NOTE on availability: Although we have 5 guest bedrooms available at Amber House, we don't accept reservations for the main house for more than 4 guests staying at one time. 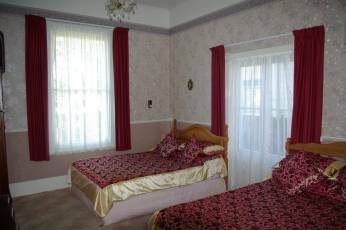 Should a particular bedroom not be showing as available for the entire duration of your planned stay, you may like to book some days in one room and some days in another room that is showing availability. If you then add an appropriate note in the comments field of both of the online booking forms at the time you make both reservations, then, at our discretion and with your agreeement, we may be able to consolidate the two separate bookings so that you spend your whole stay in one room at the cheaper of the two room rates quoted by the online system. Almost certainly you will find a vehicle space in Weka Street just outside Amber House. Parking is free and there is no time limit. Guests staying in the Balcony Suite, Rose Room and Blue Room will be able to keep an eye on their vehicles parked in Weka Street from their bedroom windows. Nelson has the lowest crime rate of any police district in New Zealand but thefts do sometimes happen - even if none of our guests have ever been robbed. Remove everything from your vehicle to the safety of your room. (This includes drink cans, jackets and maps and don't forget the glove box). Leave nothing on display. If your vehicle is the modern type with a radio actually built into the dashboard, then leave the glovebox open, the doors unlocked and the windows one inch ajar (to keep the vehicle cooler and avoid rain penetration). If your vehicle is the older type and the radio or GPS, etc., are NOT actually built into the dashboard - then close all windows and lock all doors. Please observe the 7 km/h (4 mph) speed limit for motorised vehicles at Amber House and safeguard our children. Please do not reverse from our long drive into Weka Street - there is ample room to turn around in front of the cottage at the rear of Amber House. Parking within the domain of Amber House is complimentary while you are sleeping at Amber House and for up to 8 days after you leave. We keep our garage available for cycles (maximum of 8), motorcycles (maximum of 4 solo machines with panniers), hovercraft (maximum of 1) and kayaks (maximum of 8). What's the difference between a "Bed and Breakfast" and a full service hotel? Amber House is NOT a stately home or luxurious - we believe you will find us helpful and our Guest House clean and comfortable but we don't do "swanky" or "flunky" or "obsequious" at Amber House. Please note that we are a traditional B&B in the Irish style and we are NOT a fiddly-piddly, boutique country hotel. If you don't like interacting with your host family and fellow guests and much prefer to lock yourself away in your bedroom to commune with a vast and impressive selection of toiletries, cosmetics and cuddly toys, then please choose somewhere else for your Godzone stay! Popular BB "Accommodation" mis-spellings include: accomadation, accomadations, accomodation, accomodations. Also popular are acomadation, acomadations, acomodation and acomodations. A German author, W F Buchholz, has written two articles in the on-line encyclopedia Wikipedia relevant to Amber House. We have been asked by W F Buchholz if we could place on our website some of our very early photographs of Amber House and the School (that are not in the public domain). We have agreed to try and do this and we are now beginning to print these old negatives and start scanning the prints into GIF and JPEG files. However, we are still trying to work out a scheme that will not impact too much on our allocated bandwidth since some of the scanned files are more than 20 Megabytes in size. 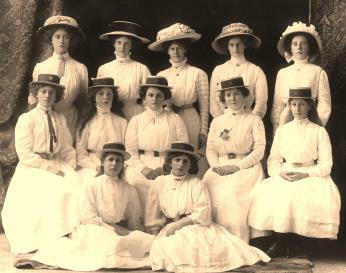 The sepia toned print shows a fetching portrait of the "Cabragh House Singing Group" and it is believed that the then proprietor and headmistress of Cabragh House school, Miss Janetta Hornsby, is in the middle of the back row and her two sisters, Charlotte and Ruth, flank her on either side. This print is probably contemporaneous with the school bell that was commisioned to celebrate Dominion status for New Zealand more than a century ago that now hangs to the right of our front door. 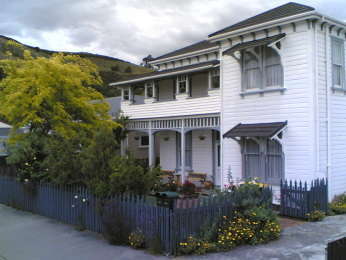 To the right is the first thumbnail of what, at the time this photograph was taken, were two of only three houses in Weka Street. The photographer must have been standing at just about the high water mark of Nelson Haven (before extensive land reclamation formed Neale Park) just over 100 years ago. If you visit Amber House, this photograph is hanging in the entrance hall (just past the Grandfather clock that pre-dates Mr Hornsby's arrival in the Antipodes by nearly 120 years). 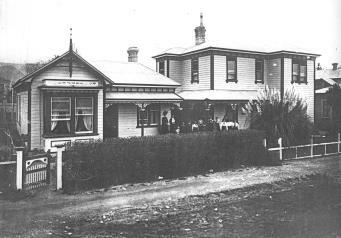 The bearded gentleman on the verandah is believed to be Mr John P Hornsby, a Nelson accountant at that time, but who had previously worked on the Irish railways and presumed to have ordered the building of both Amber and Cabragh Houses. 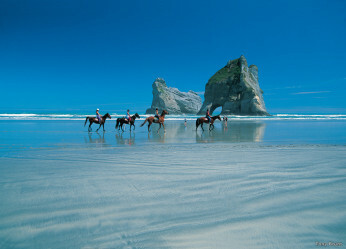 He had been in Nelson since at least early 1895 - a time of financial depression in New Zealand. 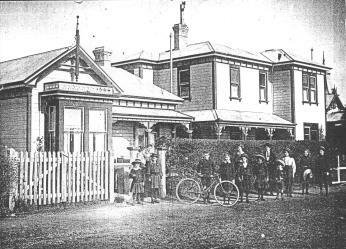 The second thumbnail of Cabragh and Amber Houses is believed to have been taken in 1906 or 1907 by an Australian visitor and was sent in 1982 from Mrs H Haughton of Queensland, Australia. At the right, the (now demolished) spire of the building that is now Paradiso Backpackers is visible. Note that the three canopies over the second storey front windows of Amber House have not yet been constructed. A tall vent pipe is now prominent in front of the Blue Room's window and a (still existing) cast iron soil stack is visible at the north-western corner of Amber House while the pampas grass on the front lawn has been considerably trimmed back.